I want a horse to have a sane mind. A fragile minded horse tends to take longer to train because you have to somewhat baby them along the way. -I prefer a more laid back kind of horse. Not lazy but doesn't spook at every little movement. 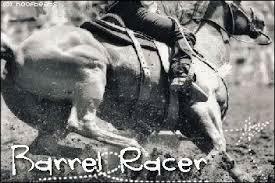 -A barrel horse can be 14 hh or 16 hh. As long as they are properly weight and size balanced throughout their body. *Martha Josey’s "Orange Smash" was almost 16.3 hh! *Fallon Taylor's Babyflo and Sherry Cervi's "Stingray" are about 14hh! - we personally prefer cow lines as opposed to racing bloodlines. -they tend to be quieter and think before they react. -they are quick and catty. -they are agile and athletic. frowned upon. Too short and parrot mouths can cause eating and chewing problems. he has a longer back, he can have a longer neck. Important piece is to be balanced. -Tie in cleanly to throatlatch. Refined where it comes into the chest. Ideal throat latch is small and refined. - Long shoulder, with the point of shoulder as low and forward as possible. - Hip and shoulder angle should match. will rely on his front-end too much and lose speed in the turns. musculature between the front legs, where the legs attach to the horse’s chest and shoulders. allows a horse to move better and makes him less prone to injury or soreness. - Knees close to ground, i.e. short, wide cannon bones. - Calf kneed or “back in the knees” is a fault. - Pigeon-toed (toed in) and splay-footed (toed out) are faults as well. (the suspensory system includes the ligaments and tendons of the legs). 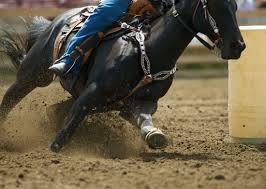 power to push when his body is bent the middle of the turn and makes him vulnerable to soreness and injury. - Good withers hold a saddle in place. -Don’t judge a young horse solely on his withers as he can develop them later (3 or 4 year old years). Should be long and not flat on top and not drop off too much. -- A lot of inside, hind-leg muscle necessary for a horse to run, stop and turn quickly. -Long smooth muscles (short bunchy muscles get sore more quickly and are choppy movers). - Strong through the gaskins, inside muscling more important than outside. apart, his whole body frame has more support and better balance. Athletic ability is tied to soundness. sound. Cow hocked is accepted over hocks that point out. lessons the stress on these areas and distributes it throughout the body. long and ground covering. Supple and soft with a gliding motion. motion and time when the legs are in the air. - Start looking at a horse at his feet and work your way up. Texture is more important than color. -The appearance and condition of the hooves are indicative of past nutrition, care and disease.  Well proportioned and has appears waxy, smooth, and shiny. - No cracks, some moisture, and is not dry or crumbly. - Coronary band should be slightly resilient, not dry and leathery. NO heat in coronary band or hoof. - Hoof should be round and not pointed or cut off square. - The slope of the hoof should match the slop of the pastern and the shoulder. - The heel should have some width to it and not be low to the ground. - Hoof should not be mule-footed (wall too steep all the way around foot) or clubfooted. -Mare tend to be very smart and will cheat you if they can. -Mares get bored easily and learn quickly so changing things up is a must. -Mares will give you their heart if you've bonded with them. -A gelding tends to be more forgiving when you make mistakes. -Everything is fine as long as he's fed. 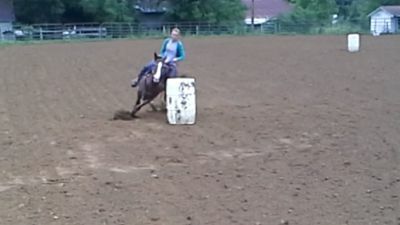 -You need to be VERY aware of where you put him at barrel races because he's aware. -Stallions tend to be easy going but like mares they tend get bored easily. -A stallion will give you his heart as long as he's treated right, as will most horses. 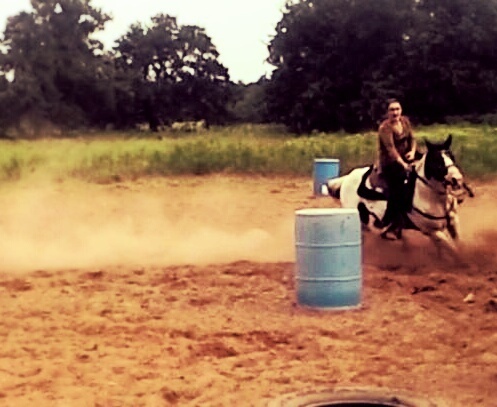 --A good barrel horse will have a ton of heart. - He will have grit and try, no matter how many times he fails he'll get up and try again just to please you!!! !